The surrounding area . . . The Welshpool region is rich in evidence of ancient cultures. 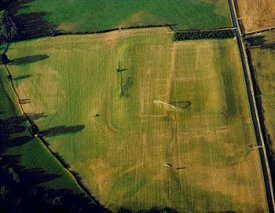 Wales' earliest farmers of the Neolithic (some 4000 year ago) built their homes and buried their dead in the fertile plain of the Severn Valley. Little survives of their everyday life but the shadowy remains of their ritual and religion can still be glimpsed from the air. 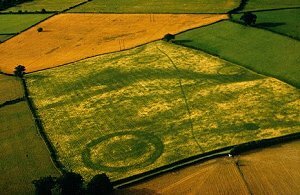 More tangible are the many standing stones and burial mounds from the Bronze Age, over 3000 years ago, but perhaps most dramatically are the hillforts, built by the Celtic tribes in the 500 years before the Roman conquest. 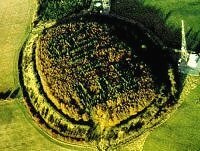 These massive enclosures with their ramparts of earth and stone are a common feature of the Welsh Marches, and fine examples can be seen near Welshpool on Long Mountain (Beacon Ring - left), at Montgomery (Ffridd Faldwyn - right), at the Breidden and Llanymynech (two of the largest in Britain) and most spectacularly at Old Oswestry in Shropshire. Legend has it that the British leader Carradoc, sometimes called Carractacus, led his campaign against the invading armies of Rome from this area. 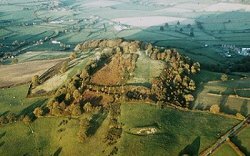 Many of the local hillforts have been said to be site of his last battle against the Roman legions, but current evidence suggests that it may have been Llanymynech Hill a few miles north of Welshpool. Although often called the Dark Ages, the 500 years following the end of Roman rule in Britain in the 5th century, is in fact a period of great learning and enlightenment. It is at this time that the border between England and Wales is first formed and the history of Welshpool in this period illustrates both emerging cultures. During this period Wales developed into a series of kingdoms perhaps echoing the tribal areas of the pre-Roman Celts. Christianity flourished under the Welsh kings and many of Wales' churches were established at this time - Welshpool's first church, sited to the east of the present parish church, was reputedly founded in the 6th century by Saint Llewelyn. The church at nearby Meifod was once the site of a great Celtic monastery linked to the Princes of Powys and today houses a magnificent carved cross perhaps coming from the grave of one of theses early princes. The decoration on the cross, which probably dates from the 9th century, also shows Viking influence. This might seem surprising but the Anglo Saxon Chronicle records a battle in 894 between invading Vikings and English forces at Buttington, just north of Welshpool. 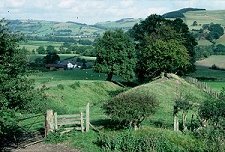 Contemporary accounts also record one of the greatest civil engineering feats of British history - the building of Offa's Dyke. The Dyke, a 6 metre high bank and ditch was constructed, perhaps in about 785, by King Offa the Saxon King of Mercia, to mark the border of his kingdom with the British kingdoms in Wales. The Dyke, well-preserved sections of which survive immediately east of Welshpool, ran the length of Wales from the Bristol Channel to the Dee Estuary and was in effect the first English - Welsh border. Today the dyke is followed for much of its length by the Offa's Dyke long distance footpath. Further information about this can be found on the Offa's Dyke Initiative website. The town of Welshpool first appears in historical records in the 1240s with the granting of a borough charter, although it seems certain that the settlement is much older. Records mention a castle here in 1196, which is probably the motte and bailey earthwork lying near the railway station. This type of castle is typical of those built by the Norman barons of William the Conqueror and could even date from 1111. It is likely that the earliest town lay between this castle and the site of the early church, Capel Llewelyn, on Salop Road. During the 13th century the new borough was laid out along what is now Broad Street and High Street and the town grew rapidly. 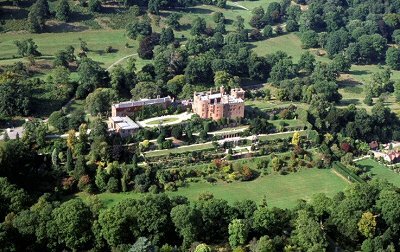 It was at this time that Powis Castle developed as the area's major stronghold. Today the castle, the seat of the Earls of Powis, is resplendent in its remarkable 17th century gardens and later parkland and is one of Welshpool's major tourist attractions. However the town also has much history to offer and many fine 17th and 18th century buildings still line its main street. Great ruined castles abound in the surrounding area, notably at Dolforwyn built by Llywelyn ap Gruffydd in 1273, and at Montgomery where the gaunt remains dominate the small medieval county town. Like much of Welshpool, Montgomery and its castle were founded in the 13th century, to replace the Norman motte and bailey at Hen Domen, but today the town's picturesque square is ringed by attractive Georgian houses and fine market hall. 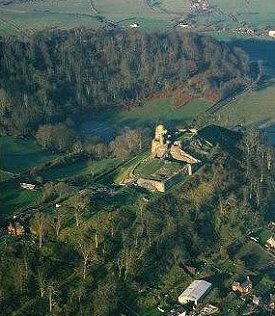 In 1644 one of the largest Civil War battles fought in Wales, involving over 5000 troops, took place in the fields below the castle. The above text was first prepared by CPAT for the Welshpool Partnership's website.